The price of fuel can vary between petrol stations even in the same area. Knowing that you are buying the cheapest petrol in your area can save you money on each fill-up. Fuel Smart (UK) is a collaborative fuel finding application, which is operated on a community driven basis. Join the existing community of users in the UK to allow you and fellow users the ability to make the informed decision about which filling station to buy fuel from. The application will allow the user to search for petrol stations using either their current GPS location or any other location, town, city or post-code chosen by the user. Fuel price coverage throughout the United Kingdom. In the region of 9000 petrol stations are monitored. In excess of 1000 database fuel price updates per week. Easily search for a number of fuel types including unleaded, diesel, super unleaded, super diesel, LRP and LPG Unlimited price searches per week. Look for petrol stations within 2, 5, 10, 15, 20, 25 or 30 miles radius of the handset or any chosen location. Once a desirable petrol station has been found, the user can then get directions to the station from their present location. Users are encouraged to collaborate with the existing user community through submitting fuel price updates from their handset, as and when they can, in an effort to maintain the correctness of the fuel price database. 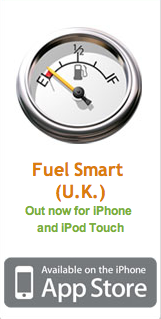 Get Fuel Smart UK Today!